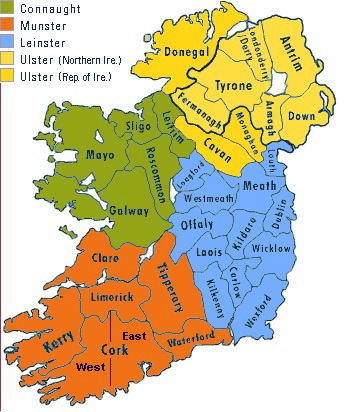 When I was in Ireland a fourth cousin told me that our Fanning family is related to that of Aengus Fanning whose family owned The Midland Tribune in Co Offaly (Kings). Dunkerrin was also mentioned. That was all they knew. Now that Rootsireland is a subscription site I decided to research the Eviston material I have in a folder and trawl through some records. I had come across quite a few Eviston-Fanning marriages and was curious to see if the Fannings involved were connected to my family. Previously I had missed records as I just searched in Co Tipperary in Rootsireland. 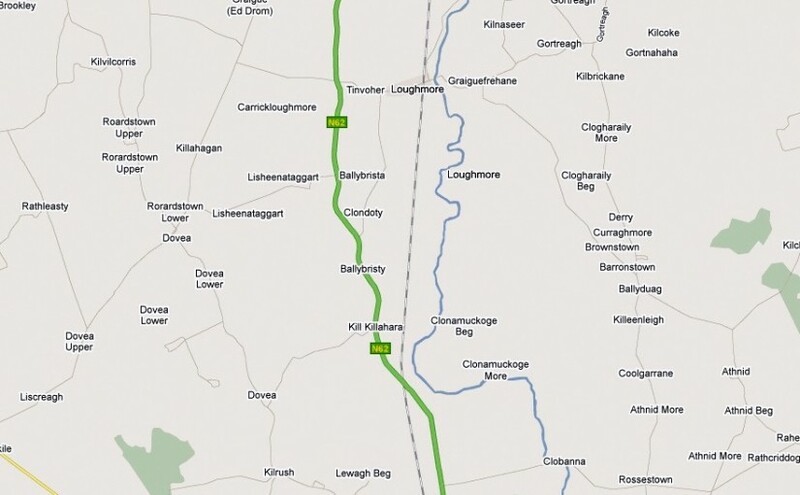 This time I did all Ireland searches and found Fanning records for Dunkerrin in Co Offaly which borders Co Tipperary. I’ll start with the Aengus Fanning connection to the Fannings of Tipperary and the Evistons. Aengus’s grandfather James Joseph Fanning is in the 1901 census as a doctor aged 30 living in Cumberland St Birr. He was born in Limerick St Roscrea on 10 July 1866. He married Anne Josephine Powell “Birdie” in Dublin on 6 Oct 1903. She was the daughter of Margaret O’Connor and John Powell. Witnesses at their wedding were Francis Norton and Mary Kate Powell of Birr. 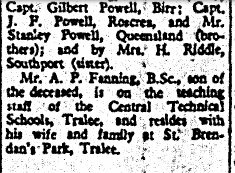 Annie and James had four boys: John Leo Martin born Birr 6 Dec 1904, Arnold Francis born Birr Nov 1905, Patrick born about 1905, James Ignatius born in 1907. James Joseph, died in Bournemouth England on 17 March 1908 and is buried in Clonoghill Cemetery Co Offaly, he was only 41. The parents of James Joseph Fanning were Martin Fanning and Mary Slattery of Roscrea Co Tipperary. Martin Fanning was born at Castleroan in Dunkerrin Parish in Sept 1829. His godparents were Martin Eviston and Judith Fanning. Martin married Mary Slattery of Glen Bower in Terryglass Parish on 17 July 1860. Witnesses were Patt Fanning and Ellen Bermingham. His second wife was Ellen Burke. Martin died in Jan 1903 aged 74 and is buried in St Cronans RC cemetery in Roscrea. 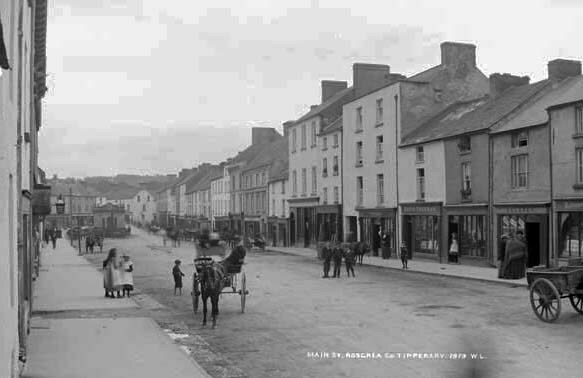 He was a shopkeeper/merchant/publican in Limerick St Roscrea Co Tipperary. Martin Fanning’s parents were William Fanning and Ellen Eviston who married in Loughmore Parish on 27th Jan 1825 witnessed by Robin Eviston and Mary Eviston. 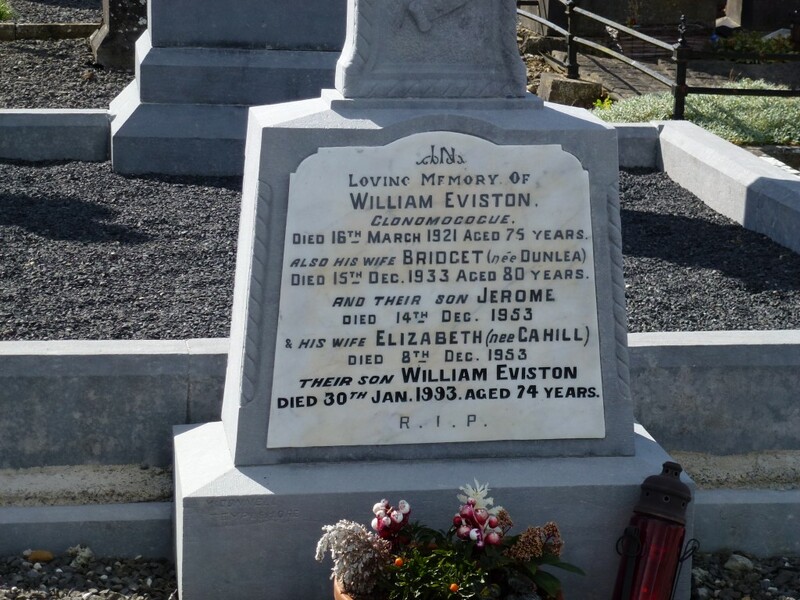 William died age 71 on 6 Mar 1866 and is buried in Dunkerrin Church of Ireland graveyard. His wife Ellen Fanning nee Eviston died Feb 7 1871 aged 70 and is buried with him. I am looking to find Ellen’s parents. So the connection to the Fannings is through the Evistons although the Fannings of Castleroan Dunkerrin may also have a link to the Fannings of Lissaroon. 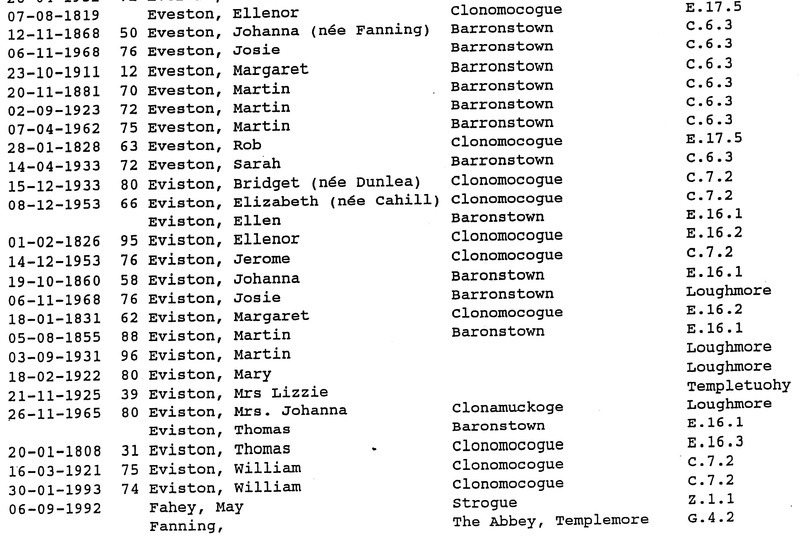 The Evistons from Clonomocogue More Thurles Co Tipperary Ireland are connected to the Fanning family from Thurles. Clonomocogue is just north of Thurles. It is spelt as Clonamuckoge in Griffith’s Valuation. I still have to research the Eviston-Fanning connections further and would appreciate any info on them or corrections if you see any mistakes or inaccuracies. Eviston is spelt in different ways: Evaston, Eveston and in the Griffith’s Valuation as Evinston. There don’t seem to have been many of them in Co Tipperary. 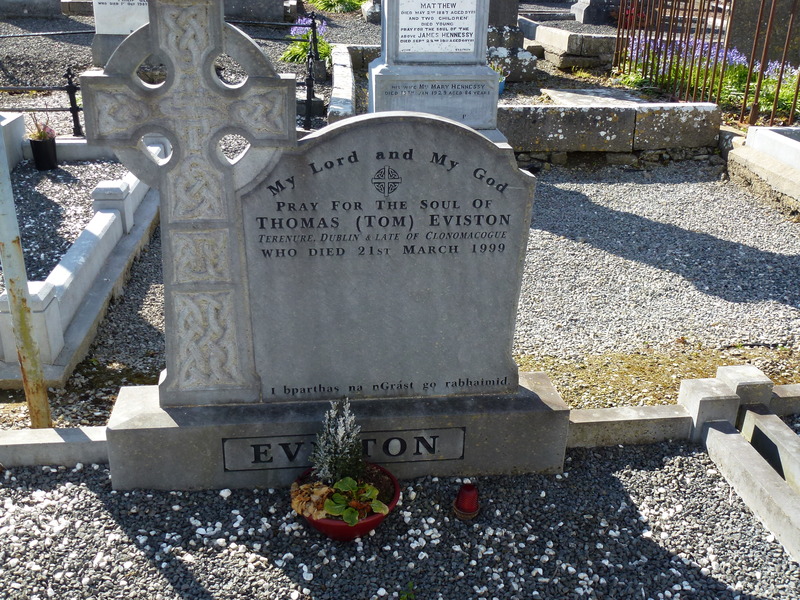 I have found records of Evistons in Thurles and Moyne Parishes. The records that North Tipperary Genealogy has for Evistons start too late to be of much use. 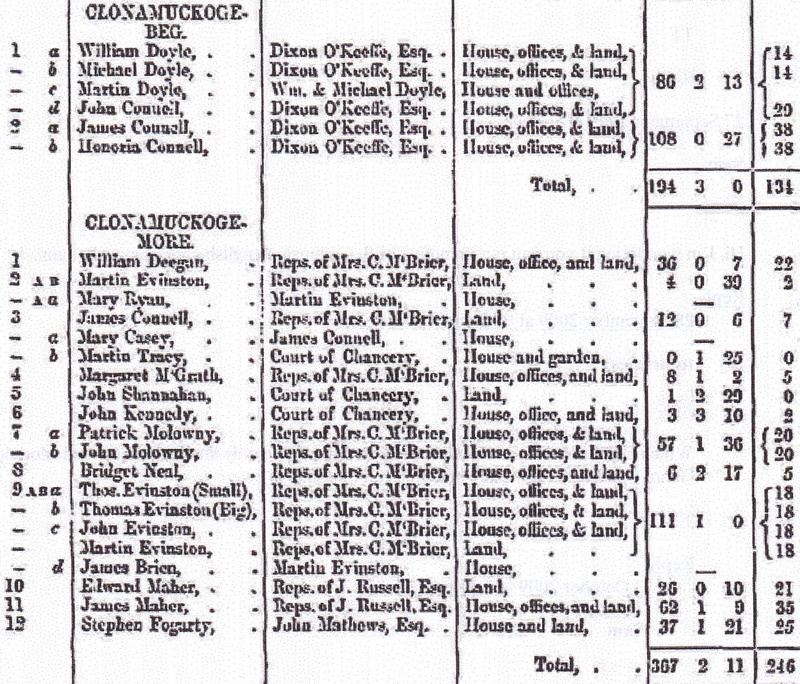 In Griffith’s Valuation at Clonamuckoge More in the Parish of Loughmoe East (Loughmore East) published in Sept 1849 Martin Evinston has 4 acres and 39 perches of land worth 2 pounds 17 shillings. He is at number 1. At number 9 are Thomas Evinston (Small) and Thomas Evinston (Big) and John Evinston and Martin Evinston. Between them they have 111 acres. In Baronstown townland in the same parish Martin Evinston has 58 acres with house, office and land. A good place to look at Griffith’s Valuations is the Ask About Ireland site. It is worth checking the date the particular parish valuations were published. This is at the end of the parish records. Looking at the descendant chart below I am sure Martin Evaston and Margaret Brennan would have had more children than Martin and Thomas but so far I haven’t been able to find them. Martin married Johanna Fanning and Thomas married Mary Fanning. Mary is buried in Ballycahill Cemetery with the Fanning family. Her father was William Fannin (Fanning) and mother was Hanera Cormack. She would have been born in Lissaroon. From “Loughmore Parish Index to Burials in Loughmore and Templeree Graveyards” which can be found in the Thurles Library Co Tipperary Ireland. There are maps at the back of this book with grave locations. They are too big to put here but if you want to know the location of a grave on this list contact me. Eviston Margaret died 8.1.1831 aged 62 years, Thomas of Clonamocoge died 20.1.1808 aged 51 years. 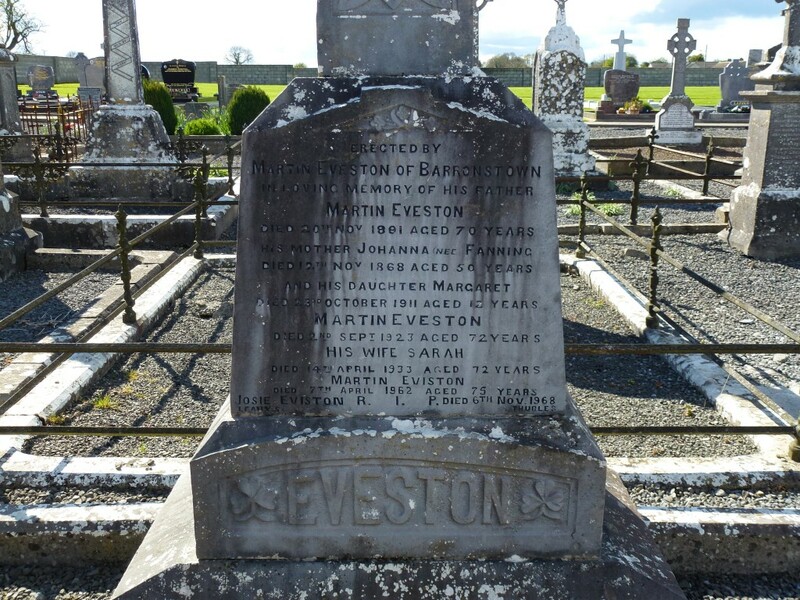 Eviston Martin, erected by Martin Eviston of Barronstown in memory of his father who died 20.11.1891 aged 70 years, his mother Johanna nee Fanning died 12.11.1869 aged 50 years, daughter Margaret died 23.10.1911 aged 12 years, Martin died 2.9.1923 aged 72 years, his wife Sarah died 14.4.1933 aged 72 years Harney Michael died 26.3.1911, his wife Bridget died 26.2.1950.Eviston William of Clonomogogue (Clonamuckoge) died 18.3.1921 aged 75 years, his wife Bridget nee Dunlea died 15.12.1933 aged 80 years. 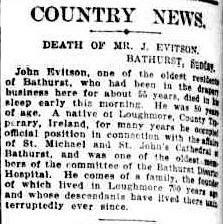 John Eviston , the son of Mary Fanning and Thomas Eviston emigrated to NSW Australia. He lived in Bathurst and was a well loved and prominent citizen. “an upright citizen, a loving father, no greater testimony can be written against the name of any man. Death came with tragic suddenness, For some time past Mr Eviston had been suffering from heart affection, a fact which will occasion no surprise when it is known that he was in his 81st year. Some little time back he was forced to take to his bed, but as a result of skillful medical attention and the careful ministrations of a loving daughter, he rallied, and was able to move about as usual. On Friday there was no indication that the end was near. His son, the Rev. Father Timothy Eviston, of Dunedoo, was on a visit to his father and left by Saturday morning’s mail. Mr Eviston remained up until about 2 a.m. to see his son off and then retired. At about 7 o’clock on Saturday morning his daughter made her usual visit to the bedside and found her father dead. Death had taken place a couple of hours earlier as a result of heart failure. 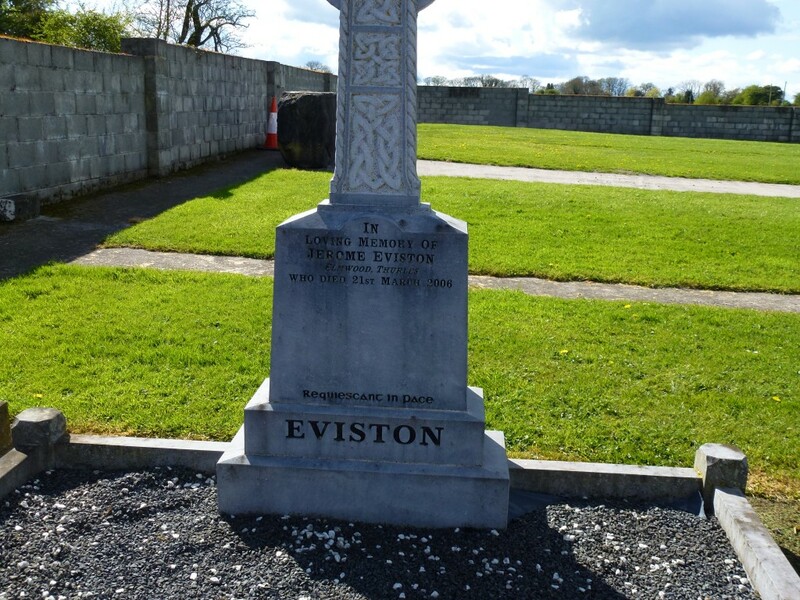 The late Mr Eviston was born at Clonomocogue, in the parish of Loughmore, County Tipperary, in 1844, He was the second son of Thomas Eviston, whose ancestors lived in this district for six generations. it is interesting to note that the deceased elder brother, Martin, still survives in the old home in his 87th year. After receiving the usual elementary education then prevailing he entered business in Thurles, where he remained twelve months. He then proceeded to Dublin, and after three years decided to leave Ireland, as it did not offer the opportunities he desired. He sailed in the “Empire of Peace” for Melbourne, which reached in May, 1864. he settled in the Clunes district and obtained a position of book-keeper to Rabby Brothers, contractors. When he was there five years he made up his mind to come to NS Wales. He later settled in Bathurst, where he married in 1870 Elizabeth Connolly, second daughter of the late John Connolly, Rossoulty, Upper Church, Tipperary, Ireland, in the early seventies he opened a business as clothier and mercer with the late James Kelaher. As Kelaher and Eviston the firm became well known and the deceased commanded a large measure of popularity and won much esteem and respect for his transparent honesty and business integrity. His activity for well night forty years was continuous and practical. AS a member of the hospital committee he was an energetic worker for that institution for more than thirty years. He was not a man that sought the limelight or looked for praise. he was deeply interested in every movement that concerned his native land. During his long residence in Bathurst he was closely associated with the different delegations that came there on behalf of the Irish cause. IN matters concerning Faith and Fatherland he was no rail-sitter. All knew where he stood. Without drum or trumpet to proclaim it, He was throughout his life an uncompromising Catholic and a true Irishman in all circumstances. He was no trimmer, and he placed no confidence in the Irish Catholic who was apologetic for either. As a Catholic who saw the development of the Bathurst parish to a large extent, and who contributed somewhat towards that development, he is perhaps best known locally. 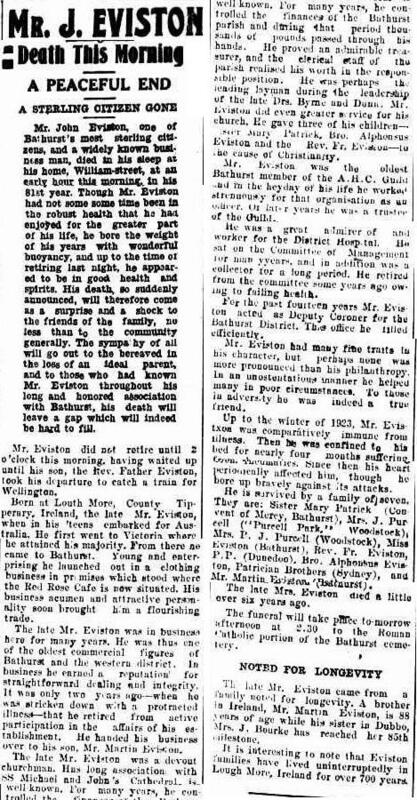 Throughout the rule of the late Dr. Byrne, of happy memory, and for most of that of his successor, the saintly and gentle Dr. Dunne, Mr Eviston’s devotion and energy in promoting the material progress of the church are well known. During this period some of the important works accomplished were the new sanctuary and improvements to the Cathedral, the building of the monastery, the addition of another story to the Convent of Mercy, the erection of the Bishop’s house and the boy’s school. The amount of clerical work which his position as treasurer was enormous, but to him it was a labour of love for which he is now enjoying his reward. When the Conference of St Vincent de Paul was established over twenty years ago he was one of the first members and until a couple of years ago was a regular attendant at the weekly meetings. he was also one of the earliest members of the Guild in its formation in Bathurst. He occupied many offices in it and at the time of his decease was trustee. he was, perhaps, the oldest Guildman in the State. He had the distinction of being one of the oldest subscribers to the “Freeman’s Journal”, having taken it for over 50 years. Deceased’s wife predeceased him by six years, and he is survived by the following members of his family: Sister M. Patrick, Convent of Mercy, Bathurst;Mesdames J. and P.J. Purcell (Woodstock), Miss Eviston (Bathurst), Rev. Father T. Eviston (Dunedoo), Rev. Brother Alphonsus (Patrician Bros., Sydney). Mr. M. Eviston, Bathurst.